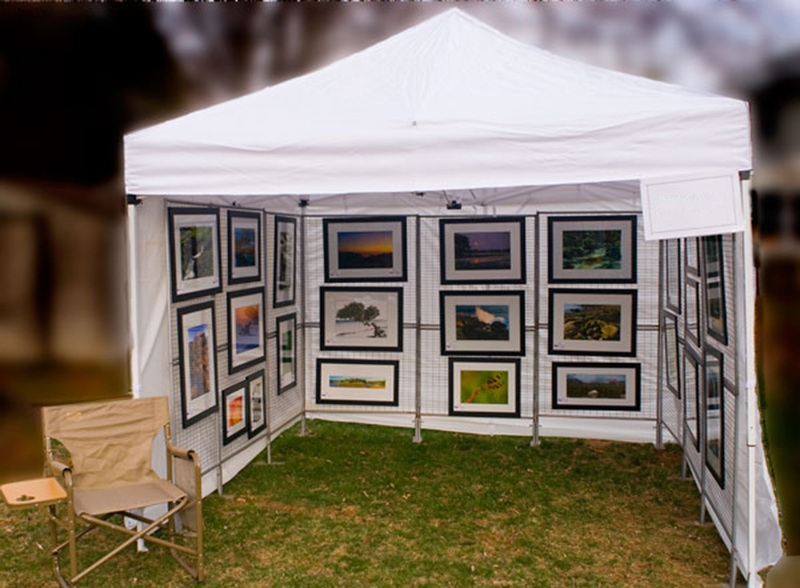 Unfortunately in attending outdoor ArtFests the weather can make or break your sales. In NJ, the weather was not particularly helpful. On Friday, we drove through calf deep water to get to our hotel. Our setup doesn’t take that long and we were concerned about wind and rain overnight, so we decided to set up early on Saturday. We were very lucky that our assigned location was relatively dry, others not so much. In comparison to Harrisburg, the crowds were light. Two of three comments on ArtFairInsiders indicated that people did not generally do well, although a few did quite well. I am sure the weather was a factor and the crowd seemed small to me, but it seemed that those who bought were largely, although not entirely, looking for beach related scenes for their beach homes. I saw a lot of art work go from a booth where the photographer specialized in beach scenes. Personal thanks to Lin Warren for stopping by my booth and giving me some great advice in response to my telling her I was relatively new and not making much progress. So once more I didn’t make my costs, but one more show to go (Bel Air in the fall) before I decide how to proceed. One way to put yourself (or myself) out there as a photographer is to participate in “ArtFests” that are held in many communities across the country. It is not only a way to directly sell your work, but to distribute your card (advertise) to potentially interested customers and get feedback on your work. The biggest advantage of these shows, in my opinion, is that unlike a gallery, where someone else decides if your work is “saleable” you get to make the decision as to whether the public should be exposed to your work and let them make the buying decision. You also bear the costs if your images don’t sell and the costs of the learning curve if you think you can do better. I had done several local shows in 2008-09 and stopped because selling got harder as the recession became more intense; I was also very busy at work. With my retirement and an improving economy, I decided to try again. So far this year, I participated in the Patriot News ArtFest in Harrisburg, PA, about an hour and ten minutes from home and the Gunpowder ArtFest in Hydes, Maryland, about a 25 minute drive for me. Harrisburg had some excellent artists and photographers and the crowd was very good. Some vendors found that sales were slow (remaining caution post-recession? ), but some folks did better on the final day. I didn’t make back my costs and I am in the process of analyzing what I need to do better, including both presentation and pricing. I did save some money by traveling back and forth each day rather than lodging at a hotel. Also I calculated mileage cost at the federal rate. Friday was setup, Saturday – Monday (Memorial Day) were show days so there were four travel days. Two days I used our Prius, but for Friday and Monday I used a Subaru and a rented trailer. The trailer was a little over $100, including insurance. After PA sales tax, gross sales were a about $300 short of direct expenses [jury and booth fees, mileage (at the federal rate), trailer rental]. If I use actual gas costs instead of the federal mileage rate I am short about $160. So although I lost money, I am close enough to profit that continuing is reasonable if I make some changes. The Gunpowder ArtFest was very different. Set at a winery, it was also a brutally hot day (90+ degrees). I had participated in this fair, which also benefits the Northern Baltimore County Art Foundation twice before. I paid an extra $50 to be in the barn (total $150) although I had not been in the barn or questioned conditions (a big mistake). The show was Saturday from noon to 7:00. Traffic was much lighter than Harrisburg, the Barn was probably a mistake as by 1 PM it was hotter than outside. It was recommended that artists bring their own lighting, but that wasn’t noted on the application. Because people were using lighting and fans, the electrical circuitry wasn’t up to the job and went down briefly at least three times. I didn’t rent a trailer because I could make multiple trips because the venue was closer to home. Total sales a pitiful $5. People around me said they had done better at total rain outs in other locations. So for show 2, a smaller loss only because expenses were so low. However, the effort was high, the day was very uncomfortable because of the heat. Probably won’t repeat this show. More experienced folks have told me that deciding which shows to attend is an important part of the equation, but also that at the same show success can vary significantly from year to year. I have another show this coming weekend: the Jersey Shore Fine Art Show. I wasn’t initially considering this one, but the area was devastated by Hurricane Sandy, and so they offered booths without a fee in order to help bring back tourism and I felt that it was both a good cause and a good deal to check it out. That will be my last show until the fall. Will report back next week.